A few years back, having your website optimized for mobile devices was more of an option than a necessity. But today, nearly everybody uses their iPhones, smartphones and?tables for nearly everything. And I don’t mean just social media. From booking flights to looking up bank balances, life now gets organized on a mobile device. As a business owner and website owner, ?it is absolutely imperative that you keep up with this trend, and you simply?cannot afford to sleep at the switch with getting your website to work perfectly on mobile devices. Search engine results highlighting mobile-friendly websites. On November 18, 2014, Google confirmed on its Official Webmaster Central Blog?that Google is?highlighting mobile-friendly websites in organic search results and set them apart from “desktop-only” versions in order to provide a positive website browsing experience for mobile users. What this means, is that when you’re on your iPhone and searching with Google, the results you’ll see will tell you whether or not a website link you’re about to click on is mobile-friendly or not before you even decide to click on it. And you?can hardly click on any menu items or buttons that you?want to use to further make your way through that website? Simply put, it’s just a total pain to find any sort of useful information on it? Yep, I’ve experienced this. So I’m actually thankful Google is highlighting and sorting out the mobile-friendly sites for me before I’m even one click deep. Saves me loads of frustration. That being said, and now switching the hat to “thinking SEO” as a business owner, it’s open to interpretation whether or not you’d like to believe that Google will actually not just filter out and show mobile-friendly sites, but prioritize them higher in search rankings because they’re bound to provide a better user experience. If you had a?quick look?at your website usage statistics? (given that you do collect user information stats), it’s highly likely that you already have about 30-50% of your audience using your website from their mobile phones. This means that up to half – HALF – of your potential clients are using their smartphone for research, internet browsing, making buying decisions. And that number is likely only going to go up. To best serve your current (and potential new) clients, please serve them the information you have on your website in an easy consumable fashion. Small font sizes, links that cannot effectively be clicked on with too-big-of-a-thumb, and other website flaws along those lines are just too cumbersome to deal with for someone who’s trying to buy from you or make a reservation with you. When there are plenty websites and businesses out there catering to this shopping need of potential buyers, you can’t afford to fall behind and lose a sale just because your website couldn’t display the needed information in an easily accessible format. It is crucial?that you start working on optimizing your website’s mobile version as quickly as possible. You will save yourself from many headaches,? ?maintain the loyalty of your customers, and give them easily-accessible content no matter where, how, or when they are looking for your business. 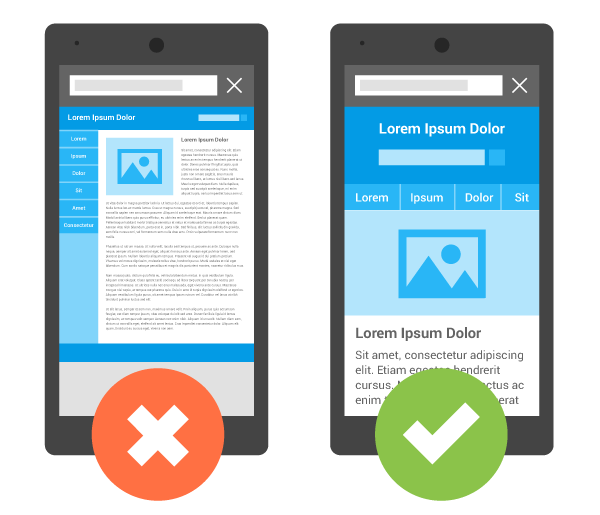 After a mobile optimization, your website will look and function as?illustrated in the picture from Google Webmaster Guidelines on the right. All the information from your website?will be presented beautifully and legibly on any iPhone, smart phone, or tablet device,… in addition to still looking just the same on a desktop or laptop computer.